KSB pumps and valves built to ensure total hygiene. Equipment used in the food and beverage industry not only needs to ensure sterile processes, the components must also satisfy stringent requirements in terms of reliability and profitability. This is the only way to ensure our position in a highly competitive market. To this end, KSB has at hand a wide range of products and services in order to offer its customers all-in-one solutions from a single source, which are tailored to the respective process, including support during the planning stage right up to after sales. KSB's series of Vita pumps offers a hygienic, safe, and reliable solution for sterile applications. KSB – your strong partner in the brewing industry. 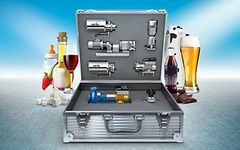 KSB pumps and valves are ideally suited to the large variety of processes involved in brewing beer. KSB matches each transport task with an optimum pump.